Settings: MakerWare .3mm/low in 20-25 minutes per knot, with the custom slicing profile from Day 110. Technical notes, math flavor: Torus knots are knots that can be wrapped around a torus (inner-tube or donut shape) without any self-intersections. The torus knot T(p,q) wraps p times around the torus like a clock at the same time that it wraps q times around the handle of the torus. The knot T(p,q) is always equivalent to the knot T(q,p), even though the two conformations can at first glance appear to be quite different. 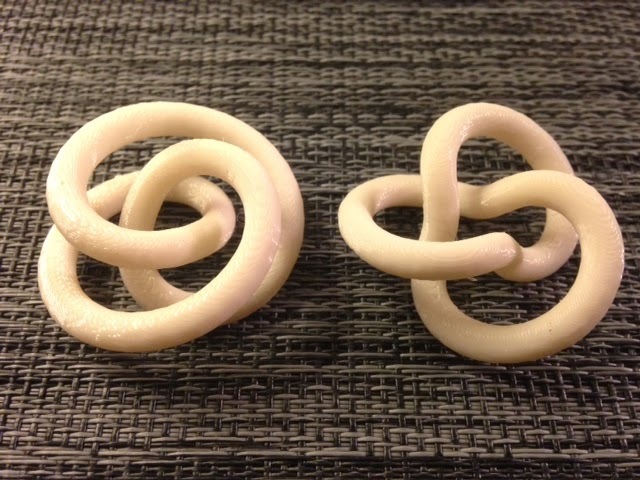 In the picture below from Paul Aspinwall at Duke University, the torus knot T(3,5)=T(5,3) wraps 3 times around the outside and 5 times around the handle. If we substitute u=pt and v=qt then as t runs from 0 to 2휋 we obtain a curve that traces the T(p,q) torus knot around the surface of the torus (and if p and q are reversed then we get the T(q,p) torus knot).